Well. Something like that. This has been a crazy year for weather around here, fluctuating from one extreme to the next. Spring started cold, went hot, then went to normal spring temperatures. It’s getting hot again, but at least that’s normal as we approach July. What hasn’t been normal is the dry weather; I’m already out of rainwater and using the tap. They did forecast one of the hottest, driest summers ever and it seems that it’s begun. And windy. I don’t know if it’s just me, but these past three years have felt especially windy. It was aggravating because we had some lovely masses of raincloud overhead a couple days ago, but they just got blown right by with barely a drop. Anyway. The late spring did provide some surprises: for example, all the roses are in bloom at once. This has never happened before. It may also have messed around with some pest life cycles, because the rose sawflies (Arge sp.) aren’t are bad as last year. And the day-neutral strawberries didn’t start bearing until the same time as the June-bearing ones. I’ve been doing a lot of container planting this year. A friend was given of a lot of large containers that she didn’t need, so she passed them along to me. Good thing too, because I’ve rather overextended myself with the vegetables this year, so now I’ve got pots of tomatoes and cabbages and salad greens and herbs all lurking to snag the unwary. Also dahlias, gladioli, freesias, calla lilies, ismene (Ismene x deflexa) and tuberous begonias – essentially, all the summer bulbs that I swore I’d never grow because they were too much trouble to dig up and overwinter properly. Of course, in pots I can just let them go dormant and stick them in the basement for winter, and they overwinter that way just fine. Also in pots is the arugula (Eruca sativa) which has now begun to flower. This isn’t as bad as if, say, lettuce started to flower, because arugula is bitter to begin with, so the effect of bolting isn’t nearly as noticeable. But it’s a sign that summer is imminent. The wildlife continues as well. On the one hand, I’m really pleased that the chicadees (Poecile atricapellus) have used the nest box, and I’m also happy that the Eastern Black Swallowtail (Papilio polyxenes)caterpillars have shown up on the dill (Anethum graveolens). I love raising butterflies and there’s always more dill than I can use. On the other hand, the squirrels have been even more annoying than usual, and the rabbits could do with a fox. Bah. Too much to talk about. I think I’ll stop typing now. What the hell? Rose sawflies (Arge sp.) in mid-May?! I knew I saw the little buggers flitting around last week, and today I must have picked almost a dozen of the larvae from the roses. Sigh. At least the Venus’ flytrap (Dionaea muscipula) ate well today. Also today, I found a caterpillar feeding on a giant blue hyssop (Agastache foeniculum) plant. In all the years I’ve been growing this species, I’ve never found something feeding on one. In fact, the only reason I noticed this one is because it happened to be on one of the small plants I potted up last week to donate to a plant sale. In other words, it wasn’t feeding on one of the many that are growing all over the place; instead it makes holes in one that I actually want to look presentable. Sigh. I’ve no clue what species the caterpillar is, so I think I’ll try raising it in captivity and hopefully it won’t turn out to be something horrible. I can’t find much concrete information on the Internet; most sites list A. foeniculum as a great attractant for pollinators but nothing for larval hosts. The closest I’ve found is a suggestion that it might be a summer azure (Celastrina neglecta), but the pictures don’t match this caterpillar (or any of the other azures/blues I checked). Oh well – maybe another butterfly diary this year? Ugh. Just when I thought I could relax a bit for summer, there’s a huge infestation of sawfly larvae (Arge sp.) on the roses. It seems to get worse every year and I have no idea where they’re all coming from. This would be the second generation of the season…I crushed the ones from spring. Aphids too, but I expected those. Happily, the Japanese beetles (Popillia japonica) are quite low this year, possibly because of whatever happened last year to make them disappear. Right now I suppose the garden’s just ticking over at its own pace. The castor beans ‘New Zealand Purple’ (Ricinus communis) and the feverfew (Tanacetum parthenium) have recently started flowering and a few other things are about to enter bloom. The four o’clocks (Mirabilis jalapa; I forget the cultivar name: Lemon something-or-other) have been flowering in their own unobtrusive way for a while now. Oh! and the ‘Helvola’ water lily has begun blooming as well. Gorgeous little thing. Day 9. Just behind the head (on the right) you can just see a stub that will eventually grow into an antenna-like projection. 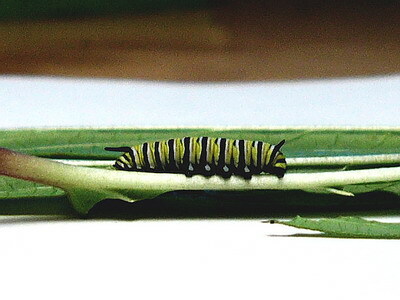 Monarch caterpillars have two pairs of these, one at either end. Presumably they act as sensory organs. Day 11. At this point it’s just over 1 cm (about a half inch) long. 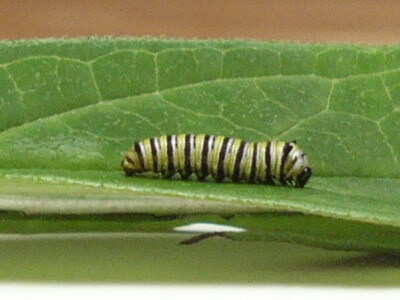 This time the head is on the left, ducked behind the midrib of the half-eaten leaf (s/he’s being shy). The antennae are now clearly visible. Just after I took this picture, it went into ecdysis. I think this is the third one, leading into the fourth instar, which would mean I missed ecdysis #2. This one seems to be growing unusually quickly; either that or (more likely) the other one that is the same age is growing unusually slowly, because it’s only half the size. After they get to about this size, though, they grow incredibly quickly, mowing through their food at quite a rate…and producing lots and lots of frass. They rest occasionally, but really only slow down to moult, which takes anywhere from one to two days. A caterpillar’s job is to grow, after all.